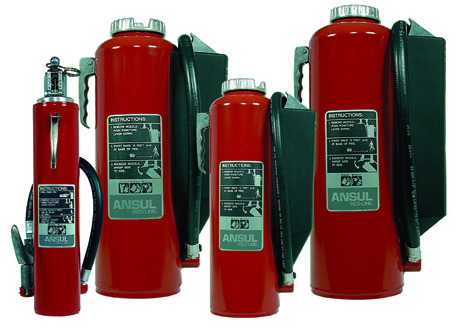 Designed for rugged industrial use, cartridge operated extinguishers are different from stored pressure extinguishers based on where the propellant for the extinguishing agent is stored. In cartridge operated units, the dry chemical is stored in the non-pressurized cylinder while the propellant; either “dry air” or nitrogen is stored in a separate cartridge located on the side of the unit. Similar to the multi-purpose uses of a regular dry chemical fire extinguisher, an industrial dry chemical fire extinguisher also protects against a number of common hazards. However, the unique combination of specialized coating and paint on the cylinder makes this unit a better choice for corrosive and more industrial environments.